Just because we’re pretty (and pink!) doesn’t mean we’re not green! 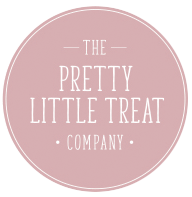 Doing our bit for the environment has always played a huge part in what we do here at Pretty Little Treat Co…in fact it’s kind of been ingrained in us from the start, it’s just that we’ve never shouted about it. Every decision we make about our products has careful consideration from the raw ingredients we use to the way we package and ship out our gorgeous products and gifts to you. As from 15th April 2019 we’re going 100% sustainable or recyclable with our packaging. You might have gathered by now that we’re not huge fans of plastic…instead we’re big on glass, aluminium and card because we love the fact that they’re all 100% home recyclable! A couple of our shower products do require that extra bit of safety when handled with slippy hands, so where glass is a no no, we use PET plastic which is completely 100% recyclable too!…simply pop it straight into your home recycle bin with the rest of your plastic. The card and paper we use are sourced from sustainable forests and are 100% recyclable too! Same goes for our mail out boxes these are FSC sourced and the packing chips we use are biodegradable, made from a corn starch, pop one in water and see it disappear! or just throw in your compost bin. We also reuse packaging materials sent by our suppliers and in doing so keeping waste to an absolute minimum! We’ve also opted for a biodegradable, recyclable and compostible gummed tape instead of the usual plastic packing tape. And the cello bags that we use in our products are made from a biodegradable plant material. 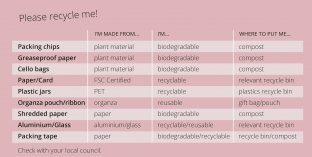 According to the Sustainable Packaging Coalition best practice for sustainability in order of preference is: Reduce, Reuse, Recycle, Compost, Energy Recovery, Landfill. Read their Design for Recycled Content Guide here. We use natural ingredients which we source from local UK suppliers where possible. This is something we will always strive to do as we believe that not only is supporting local businesses a must, but it also cuts down on our carbon footprint too! We don’t use parabens, SLS or microbeads either, and in Feb 2017 we changed our cosmetic glitter to a natural mica so it doesn’t harm our fishy friends! We will never ever test our products on animals full stop.